Wrangell-St. Elias National Park and Reserve is located in southeastern Alaska just north of the Alaskan panhandle. It is the largest national park in the United States, encompassing eleven million acres of land. The park is almost completely undeveloped, making it a dream destination for self-sufficient outdoor enthusiasts. The park encompasses a wide variety of terrain from mountains to glaciers. Four mountain ranges with nine of the highest mountains in the United States lie within the park; the largest mountain within the park is Mount St. Elias at 18,008 feet. The park is home to Bagley Ice Field and Malaspina Glacier, and several rivers wind through and around park lands. Many species of wildlife make their home in Wrangell-St. Elias National Park, including Dall sheep, moose, and black, brown and grizzly bears. The National Park Service recommends that visitors planning independent travel in the park should be experienced in survival techniques and living in primitive conditions. Facilities and assistance common in other national parks are minimal to nonexistent in Wrangell-St. Elias; for example, there are no maintained hiking trails in the park. If travelers experience any problems or accidents requiring immediate medical attention and/ or rescue, the expected response time will be slow due to the extreme conditions, weather, and lack of access. Independent groups are requested to file an itinerary with friends, family and the Park Service before leaving for the back country areas of the park. Visitors are free to plan travel that suits their experience level and interests, ranging from fishing and hunting to backpacking, kayaking and mountain climbing. Some areas of the park have year round snow, particularly around the Bagley Ice Field, where skiing is permitted. Camping is allowed throughout the park free of charge; no permits are necessary. Some land within the park is privately owned, and permission of the land owner is required before visitors can travel through or camp in these areas. 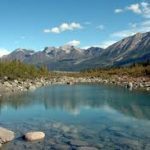 For individuals who are less experienced travelling in back country areas, many tour operators and guide services offer a wide variety of trips into Wrangell-St. Elias. Getting to the park is easy by car, bus or plane. The Park is about 180 miles east of Anchorage on Alaska State Highway 1. Visitors coming from the north can drive in on the Richardson Highway. Scheduled air service is available from Anchorage twice weekly on Copper Valley Air; bus service is also available from Anchorage. The main entrance to the park is in Copper Center, about ten miles south of the town of Glennallen. The Visitor Center at the main entrance is open all year round, and provides information and exhibits about the park. Park rangers lead guided tours every day during the summer. Visitors may also purchase fishing and hunting licenses at the Visitor Center. Once at the park entrance, only two roads, both unpaved, lead into the park’s wilderness areas. Many airstrips are located throughout the park, and are accessible via air taxi service. One of the roads leads to two small villages within the park, McCarthy and Kennicott. The road ends at the edge of the Kennicott River, and visitors must cross a bridge on foot to get to these communities. Lodges, bed and breakfast inns, and restaurants are available in and around McCarthy and Kennicott. Some tour companies are based in these communities, and offer flight seeing, river rafting and glacier hiking trips.